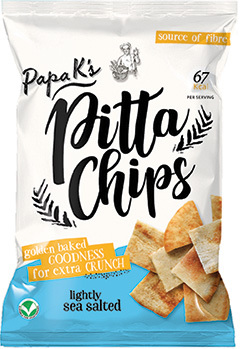 Papa K's new Golden Baked Pitta Chips and Wholemeal Pitta Chips are a perfect nutritious snack, a good source of fibre and very moreish eaten on their own or enjoyed with dips and other pairings. Mama K Foods produces authentic tasting Middle Eastern & Mediterranean Snacks, Salads & Dips. We use only the finest ingredients including fresh market produce and the purest Mediterranean Olive Oil. 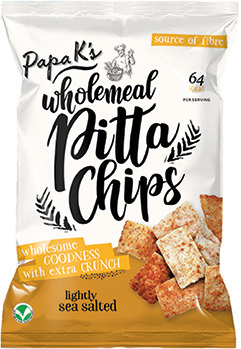 Mama K Foods products cater for consumer dietary requirements such as vegetarian and gluten free diets with a core focus on reducing salt and fat content. We aim to provide healthy food products by following modern food trends and evolving in line with consumer demands. Mama K Foods products are manufactured at modern EU approved Production sites operating in accordance with the HACCP and BRC guidelines. At each step of the process we do everything necessary to ensure the highest quality and best tasting products.